Our last day in the Pacific Northwest was not about coffee. Today was about hanging out in Olympia and then taking a ride down the Peninsula for a hike in the Olympic National Forest. We were short on time but from past trips we knew the drive down 101 would be worth the trip on a sunny day with the Olympic Mountains in view. We get to our destination but the road to the trail head was still closed from last year due to the devastating summer forest fires. 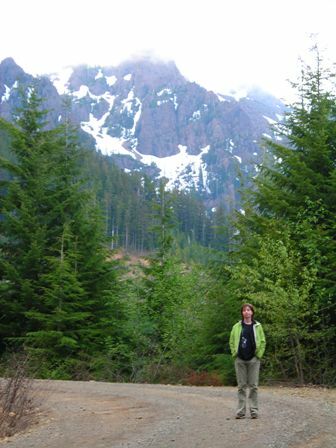 We decided to turn around and head toward another trail called Mt Ellinor. In order to get to the trail head we had to drive up a fire road about 3000 ft in elevation. The views and the vastness were incredible and driving a little to close to the edge of the road would be a long way down. We get to the top of what’s called the “lower trail head” of Mt Ellinor and we decide to stop and park because just beyond the road is completely snow covered. Also there were many emergency vehicles and emergency folks standing around and appearing pretty calm. To us it looks like there is some sort of training happening or the road is closed because of snow. Amelia and I are studying the map at the trail head when she says “Aim look”. 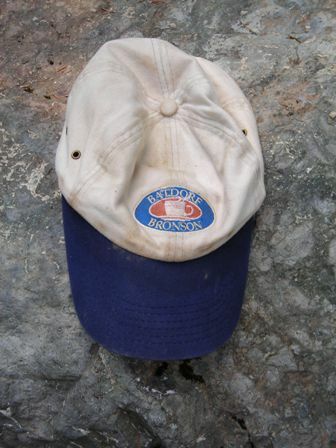 I look down and on a huge rock beside me is a Batdorf and Bronson hat that someone had apparently left. No freaking kidding! We were speechless then laughed hysterically. Yes, we left it there – for posterity. As we headed into the trail, surrounded by such awesome and dramatic beauty we were told that the emergency folks were also headed in because 2 people were trapped and hurt on the summit of Mt Ellinor and another hiker was hurt at the entrance of the avalanche shoot just before the summit. They were pretty sure they couldn’t make it to the summit in time before nightfall let alone carry 2 guys back down so they were trying to secure a helicopter. We decided to just check out part of the trail and head back down the mountain and save the adventure for our next trip. Today’s photos posted here. OK. We'll get a deprogrammer who gives out souvenir caps. Jim, the sign I got from finding the hat at Mt Ellinor was that the B&B Cult is EVERYWHERE! Want to join? Membership is free, you already meet the daily doppio quota so all you need is a little more of the rah, rah spirit! Meet our target market - the adventurous, the hiker, the biker....you get the idea... Although our retail store is missing a few employees. Maybe we should send out a search party?? ?